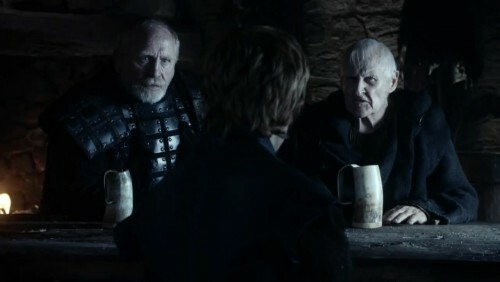 Ah-ha, the first public look at both Lord Commander Mormont, the Old Bear, and Maester Aemon. I had the pleasure of seeing both acting when I was at Magheramorne, and I think everyone’s going to be quite pleased with them. I also chatted with James Cosmo a bit, and he seems to have a great appreciation for the sort of lifestyle the men of the Night’s Watch must lead, and the difficulties they face as a neglected institution. There are some small differences from the novel. In the book, this scene takes place with most of the Night’s Watch officers present, but here it’s just Mormont and Aemon. Also, we can see that Aemon’s eyes are not the “milky white” described in the books, as the production has opted not to fit Peter Vaughan with contacts to simulate heavy cataracts. Finally, some of the dialog we hear Aemon speaking is originally Mormont’s in the novel.